James Harden wrote his name in the history book by becoming the only NBA player to have scored 30 or more points against all 29 opponents in a single regular season when he scored 31 points of Houston Rockets’ 121-105 win over Atlanta Hawks on Tuesday night, a feat that can be like to Cristiano Ronaldo achievement in his penultimate season in the La Liga, where he scored against all 19 clubs he played against. James Harden also added 8 rebounds and 10 assists to his 31 points on the night at the Philips Arena. James Harden impressive season also includes a 32 consecutive 30 or more points that were put to a halt in the Rockets’ 119 – 111 win over Tuesday night’s opponent, Atlanta Hawks, where James Harden finished with 28 points. With the Tuesday win, Rockets completed a regular-season double over their opponent for a 2nd successive year. James Harden has now overtaken 2 of the 3 previous records of longest 30+ points streak held by Former NBA star, Wilt Chamberlain, who had a steak of 65, 31 and 25. I personally don’t think any player will ever equal or beat Chamberlain’s 65 30+ point streak. James Harden ruthlessness in front of opposition basket has never been in doubt ever since his days as Oklahoma City Thunder, but his defensive play had raised eyebrows. However, since his trade to the Rockets, his all-round performances have been top notch. James Harden started the season on a rough patch with the Rockets though, going 4-7, many attributed it to James Harden missing 3-straight games due to injury, but with Harden back in the team, Rockets went on a 5-game winning streak. James Harden’s 30+ points scoring run did not start until mid-December 2018, and against who else? a team that has another James in her ranks, LA Lakers. James Harden ran LeBron James and the Lakers raged scoring 50, 10 & 11 (Pts, Reb & Ast) in a 126 – 111 victory, with LeBron limited to just 29, 5 & 4. James Harden never looked back since that victory, even in defeats such as the 117-112 loss to the former team, where James Harden still finished with 42 points. A scoring run that also includes career-high points, 61 points in Rockets 114 – 110 defeat of the New York Knicks. Harden’s points streak may be over, He still leads the NBA with a staggering 36.3 points per game on the average, way ahead of former record 30.12 per game, held by Chicago Bulls’ Michael ‘air’ Jordan. 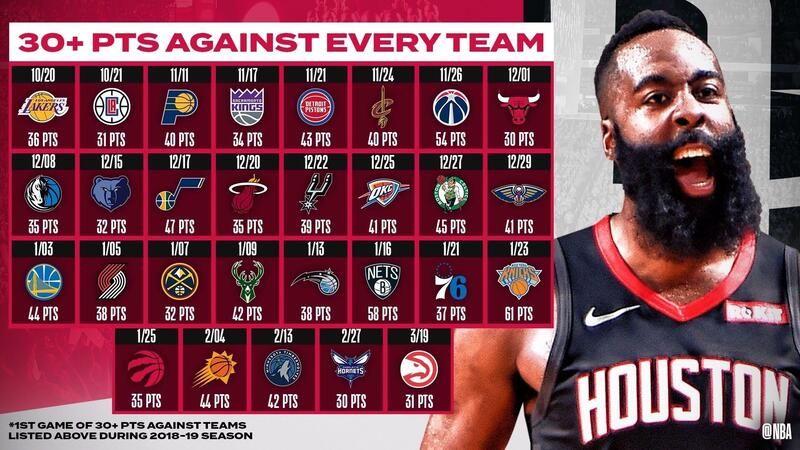 Harden has scored 50+ points in 6 different games this season against Washington Wizards-54 pts, Memphis Grizzlies-57 pts, Brooklyn Nets-58 pts, LA Lakers-50 pts, New York Knicks-61 pts, Miami Heats-58 pts, joining the likes of Michael Jordan in a few elite group that scored 50+ points in more than 5 games in a regular season. Blog can be found on my other accounts under same Username. Thank you for your time folks.